A History of 'The Poplars' in Law Lane. Gibson. But the history of this house is much more involved. It was on the 31 July 1922 that Herbert Gibson (farmer at Adgill Grove Farm, Southowram) bought Yew Tree Farm for £1400. This was at auction, and was known as Lot 3. This farm included land on which The Poplars was built at a later date. An abstract taken from the title deed of Geoffrey Wilson Marshall (more later) shows that there were three people named as vendors of this land. They were Walter Freeman, Gentleman, Caroline Kay of Hall Ings, Southowram, and Lewis Rhodes. I do not know any other details. In 1926, on the 16th October, Herbert Gibson and Emily Gibson took out a mortgage of 1000 from the Halifax Equitable Building Society at 5% interest in favour of Martin's Bank Ltd. This loan was repaid on the 4th May 1933. Money from this loan was possibly used to pay for the building of The Poplars about that time. People I spoke to heard that a local resident, Miss Marjory Dobson, said that her father built the house. He was a builder, called Herbert Dobson, and he built the two semidetached re brick bungalows, now numbers 8 and 9 Yew Trees next to The Poplars. Number 8 was where he lived, and Marjory lived there all her life. No other record can be found of The Poplars being built. On the P May 1933, an official search was made for Herbert Gibson on 'All that dwelling house known as The Poplars, Law Lane, Southowram, near Halifax' indicates that the details about it so far are correct. However, from this time until Mr Geoffrey Wilson Marshall, the actual ownership record is confusing because more than one owner appears to have possession at the same time. 31 May 1933, to Anne Hanson of Hipperholme. House, Hove Edge, formerly of The Poplars' was advanced a mortgage of £785 from Huddersfield Building Society to buy The Poplars. This included £200 of her own money. The next day, on the 20th August 1936, a Conveyance was made to the said Anne Hanson, vendor, and Geoffrey Wilson Marshall, quarry owner, the purchaser, for £750. Southowram, known as the Purchaser, the detached dwelling house and gardens and out buildings known as The Poplars and is now in the Occupation of Mr Oliver Holdsworth but was formerly in the occupation of the Vendor, Anne Hanson'. It may be that Mr Oliver Holdsworth rented the property at this time. After another ten years, the house was sold, and the conveyance made on the 30th January 1947, between 'Geoffrey Wilson Marshall, Vendor, quarry owner, of gate House, Southowram, and Edward Maurice Drake, Purchaser, of Dalemore, Savile Park, Halifax, of the property and dwelling house known as The Poplars, Law Lane, Halifax'. On the 26th March 1965, a Deed of Gift was made from Edward Maurice Drake to his wife, Audrey Bowes Drake of the whole property known as the Poplars. When she died the house was sold on 21" October 1988, according to the conveyance of that date, to Jeremy and Theresa Collingwood. They paid £90,000 for the house, but only stayed for two years then returned to the London area, where Jeremy worked in the Music industry for HMV. worked in the gardens at the back, but never met them. Since then, there have been two further owners, and all the three of us are still living! Mrs Jenny McGall, a local resident, knew Mr And Mrs Drake very well, and recalls that 'They were very well suited, really nice people, with no edge to them'. Mr Drake was a Solicitor and is buried in St Anne's Church yard. She said he was very well read, and a real gentleman who always stood up whenever Jenny went to see them. Mrs Drake was the daughter of a mill owner in Elland, and inherited a lot of money. The couple loved sailing, and went on many cruises. Unfortunately, Mrs Drake had a stroke in her early 70's, and required nursing care 24 hours a day. They had no children, and she loved to see Jenny's family, especially when they played in the gardens or on the stair lift installed in the house. Apparently, she had a marvellous sense of humour and a great sense of fun. She was extremely generous, and always took Jenny out to lunch for her birthday. Jenny worked for Mrs Drake until she died, and Mrs Drake was a real friend. She had a niece and a nephew, Peter Drake, who was also a solicitor. She spent a lot of time watching the birds visiting the back gardens, which were landscaped in the 1930's. It's an unobtrusive house, that you don't really notice among those semidetached properties which make up Yew Trees. And, yes there is a connection with the Marshall family who lived in the now demolished Yew Trees House which was further along the road and opposite the shops. (You can still see the original gate posts, much overgrown.) But the truth is very different from the story I was told! These notes are taken from the Deeds of The Poplars, 7 Yew Trees, Southowram, Halifax. 31st July 1922 Herbert Gibson, of Adgill Grove Farm, Southowram. Purchased Yew Tree Farm for, known as Lot 3 for £1400 . This included land on which the house named the Poplars was built at a later date. The Vendors of the sale of lot 3 were :- Walter Freeman, gentleman; Caroline Kay of Hall Ings, Southowram; and Lewis Rhodes. This was an abstract taken from the title deed of Geoffrey Wilson Marshall of The Poplars, Law lane. which was built about that time. A local resident Miss Marjory Dobson is thought [from gossip] to have said that her father Herbert Dobson built the Poplars. After which he built the semi detached bungalows 8 and9 Law Lane, number 8 being for himself. No other record can be found of the Poplars being built. From here until Mr Geoffrey Wilson Marshall, the actual ownership record is confusing because more than one owner appears to have possession at the same time. 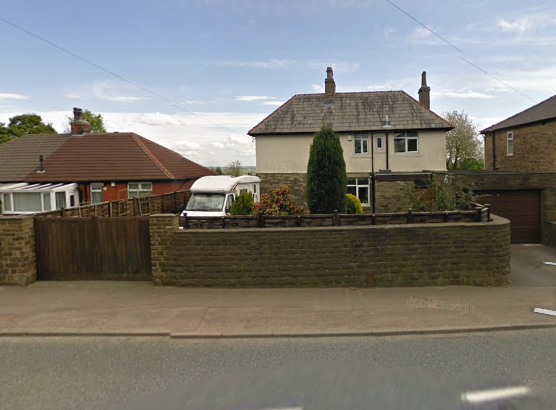 3rd May 1933 an official search was made for Herbert Gibson on 'All that dwelling house known as The Poplars, Law Lane, Southowram, near Halifax which indicated that details so far are correct. 31st May 1933 Sold by the Vendors Herbert Gibson and Emily Gibson The Poplars bounded south and east by Yew Tree Farm and north by Mr H Dobson, to the Purchaser Anne Hanson of Hipperholme. 20th August 1936 Conveyance made to Anne Hanson vendor and Geoffrey Wilson Marshall quarry owner, Purchaser for £750. 20th August 1936 Conveyance is made between Anne Hanson of Well House, Hove Edge vendor and Geoffrey Wilson Marshall of Gate House, Southowram, known as the Purchaser, the detached dwelling house and gardens and out buildings known as The Poplars and is now in the Occupation of Mr Oliver Holdsworth but was formerly in the occupation of the Vendor [Anne Hanson]. park, Halifax, of the property and dwelling house known as the Poplars, Law Lane, Halifax. Note the entry 20th August 1936, the name Mr Oliver Holdsworth. 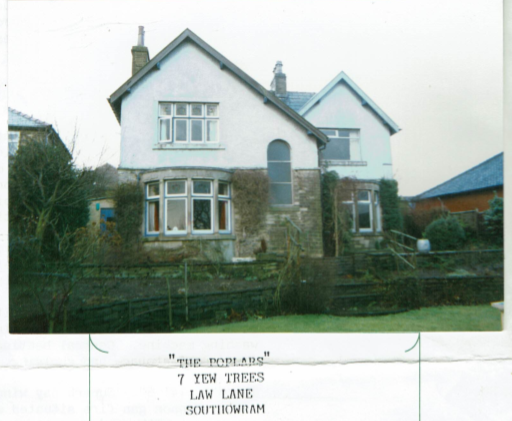 It may be that at one time the Poplars was used as a rented property. 2V October 1988 After the death of Mrs Audrey Bowes Drake the Poplars was sold. A conveyance was made out on this date. There were three further owners including the present owner, all of whom are still living.